Jill Mieszala has been a dedicated volunteer at Cowlishaw Elementary for the past seven years, taking on numerous volunteer positions and chairing Staff Appreciation Week. 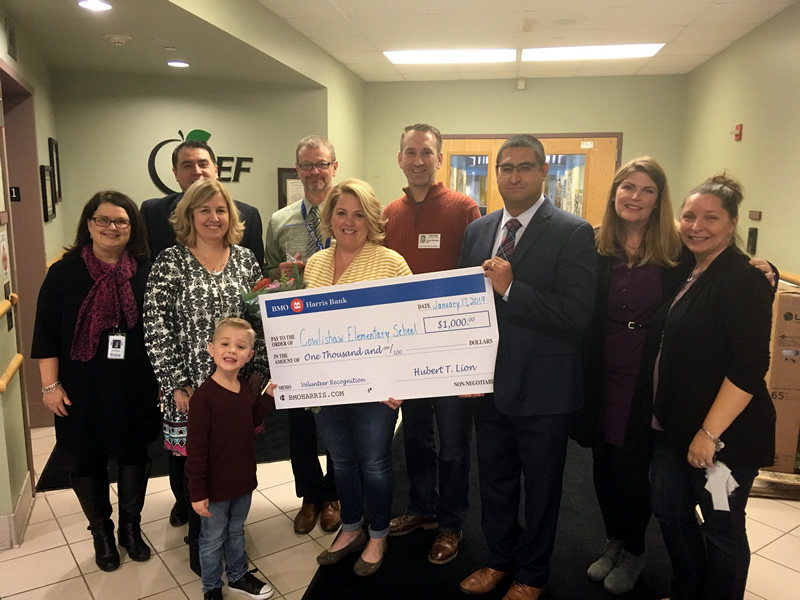 Because of her service and commitment to Cowlishaw Elementary School, she is being named the BMO Harris Bank District 204 Volunteer of the Month. Jill has five children who attend District 204 schools. When she started volunteering at Cowlishaw seven years ago, she had young children and helped out with tasks she could complete from home. Through the years, she took on additional volunteer positions including chairing the spring dance, helping with class parties, working in the holiday store, helping in the LMC, being a head room parent and a field day volunteer. Where there was a need, Jill was there to help! At Cowlishaw, she is best known for the elaborate staff meals she prepares throughout the year and during Teacher Appreciation Week. Beginning the meal preparations several hours in advance, Jill provides a variety of entrees, salads and desserts for the staff. Jill and her parent volunteers also decorate the room and tables to provide a beautiful dining atmosphere. One of her nominations states, "She goes above and beyond to show Cowlishaw staff how much they are appreciated. Her leadership skills, outstanding organization and attention to detail make these staff meals a huge success!" Jill has been volunteering since she was a child and was raised to give back to the community. She enjoys volunteering and says she is honored to know that what she does makes a difference. She and her husband are raising their children to give and think of others first because the rewards are boundless.